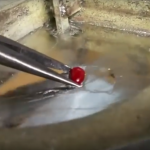 Watch how well our Polymer coated bullets stand up to 705 degree heat. After almost 1 minute sitting in molten lead the Polymer coating is still intact. At this point the lead core is now liquid. You will also observe that the Polymer coating does not melt, burn or smoke.